If you have a vegetable garden, or even a few pots of edibles, one of the best parts about summer is being able to step out the door and snip or pick fresh produce for meals. Salads, especially, are one of those staple main or side dishes that are perfect on hot days when you don’t feel like cooking. 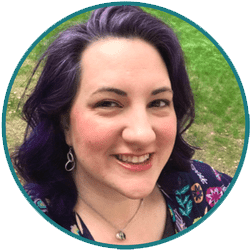 Today I have a great guest post for you from Tara Nolan, the author of Raised Bed Revolution. 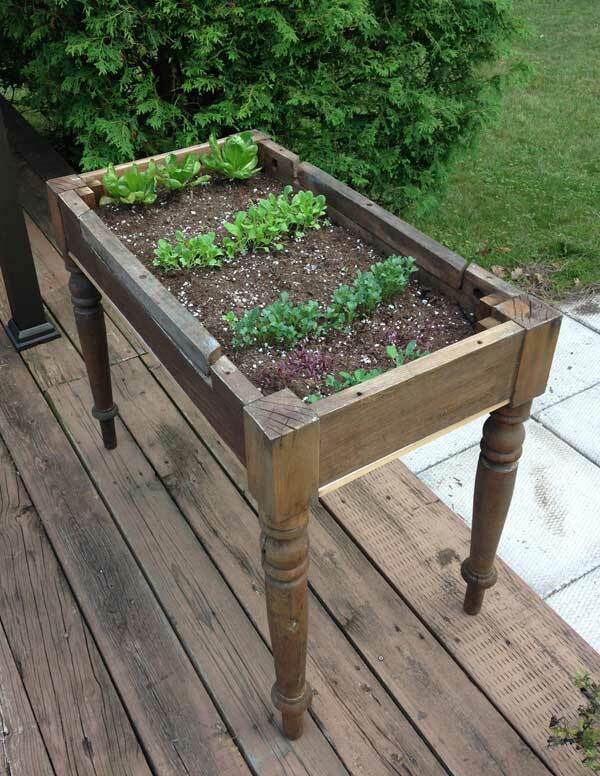 She is going to teach you how easy it is to turn an old table or desk into a funky cool raised bed for growing your own salad! 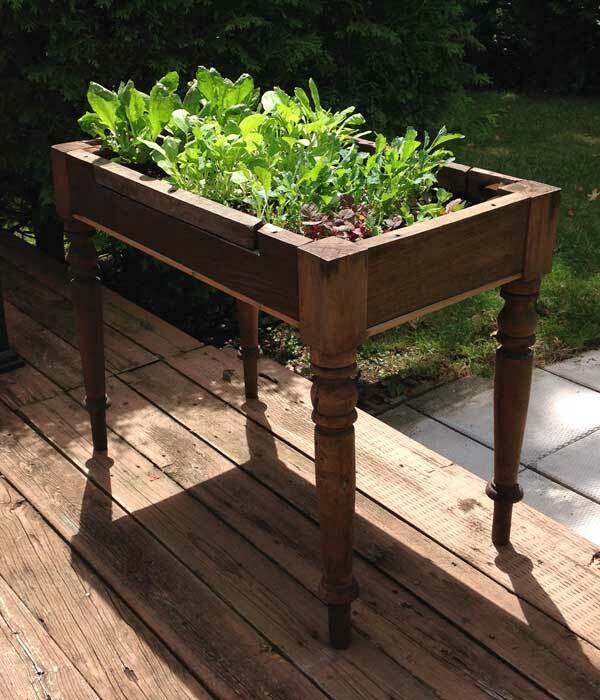 One of the projects that I knew I wanted to build for Raised Bed Revolution was a salad table. I’d seen one in a DIY book years earlier and loved the simplicity of building a basic structure for one type of crop. 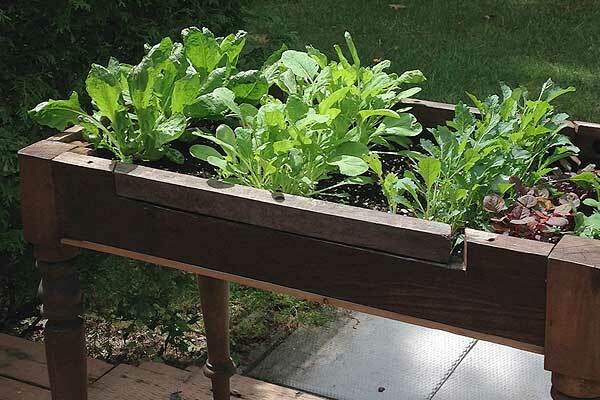 Lettuces and other greens can grow in a pretty shallow environment, so I though I would search for a set of four funky table legs and then build an easy DIY wooden tray to secure on top of them. I found sets of two and three legs, but I didn’t realize how hard it would be to find four in the same style. So, I adjusted my plan and started looking for tables. I found one with a top that was unattached. I nodded as the antique seller tried to tell me how easy it would be to nail back in place, but I knew I didn’t need that tabletop. When I got the table home, I tossed it aside and got to work on my salad table. 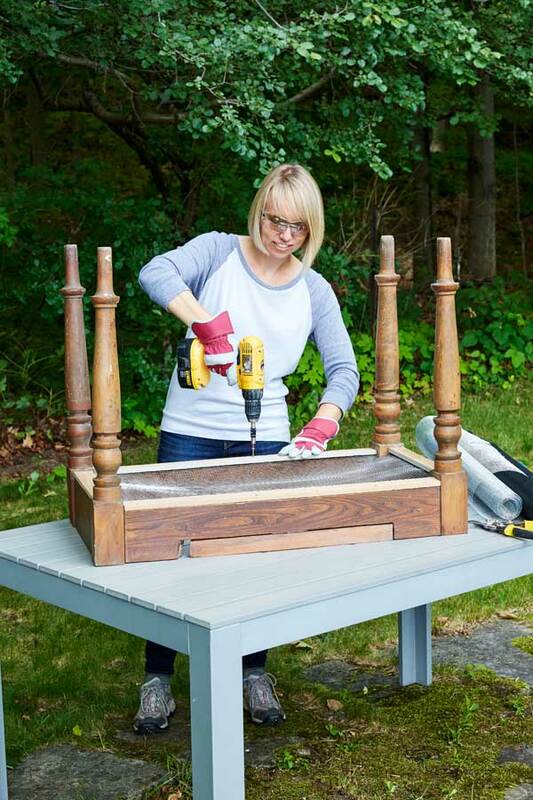 Remove the top flat part of the table, leaving the decorative sides in place. With gloves on (to protect from all the sharp edges), measure out the hardware cloth and use wire cutters or tin snips to cut it to size to cover the bottom part of the table top. Measure out your cedar lattice and secure it around the undersides of the table with screws so it covers the edges of the hardware cloth. Depending on the size of your table, you may also want to create a support beam across the middle. Take a quick peek to ensure there is no hardware cloth peeking out from under the lattice strips. Snip any overhand accordingly. Turn the table back over and line the inside of your table with landscape fabric. 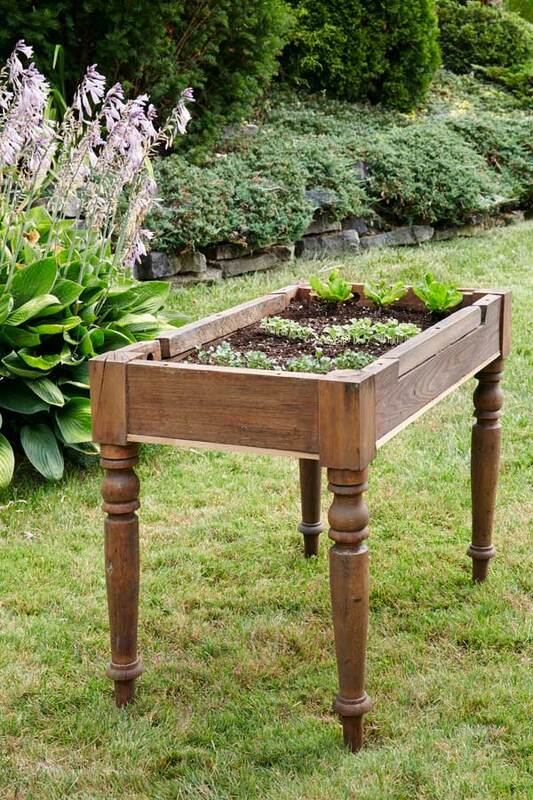 Fill your table with soil and plant! You don’t have to just opt for one type of lettuce. There are so many greens available, from leafy lettuces to Asian varieties, like bok choy, tatsoi and mizuna. Pea and sunflower shoots are also tasty additions, as are various herbs. One thing I would recommend if planting from seeds, is staggering your seed planting by a few days so that you have continuous crops. If you like this project, there are lots more like it! 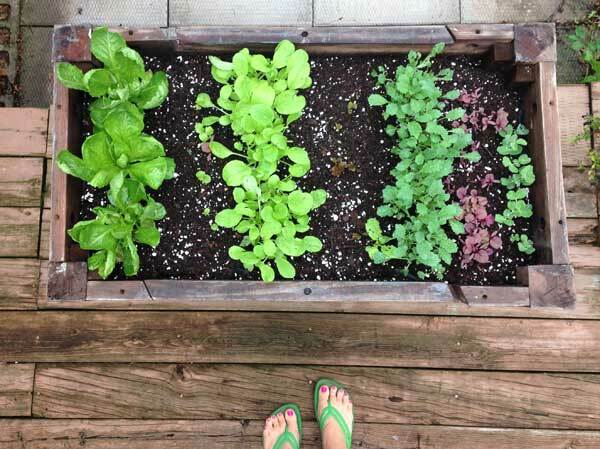 Check out lots of great raised bed projects that are both big and small in Raised Bed Revolution! 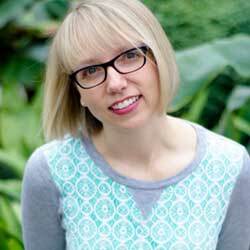 Tara Nolan is a garden writer and editor whose work has appeared in national newspapers and magazines. 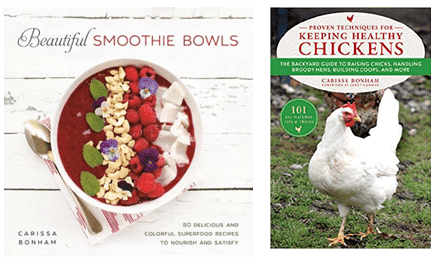 She is a co-founder, with three other garden writers, of Savvy Gardening and was the award-winning web editor of Canadian Gardening magazine’s website for six years. Tara has recently written her first gardening book: Raised Bed Revolution (May, 2016). Check out behind-the-scenes sneak peaks and more inspiration and tips on her Facebook page! You can also follow her on Twitter and Instagram. Very cute!! I love raised beds. We only have them and I use additional practices with them like square foot,companion planting,trap crops and vertical gardening principles. Will have to check out her book.